Kaos GL is a Turkish LGBQI organisation and member of IGLYO. To discover more about the organisation’s work and initiatives, we interviewed Hakan, Finance and Project Coordinator. 1) What is your name and your role inside Kaos GL? My name is Hakan. I work as a Finance Coordinator. I’m also Project Coordinator for “Internet Freedom and Sexual Rights” project which is coordinated by APC (South Africa) and supported by SIDA (Swedish International Development Agency). Besides that I work for fundrasing works for my organization and devoloping our website (kaosgl.org) with news, interviews etc. 2) What is a very exciting project Kaos GL is currently working on? Actually, I find all of our project very exciting. All projects improving LGBTİ rights are very exciting for me. Kaos GL’s EU projects have been implemented since early 2010s. These include: “Diversity Strategic Litigation Network”, “Raising Awareness of the Parliament, GOs and NGOs Regarding Human Rights of LGBTs”, “Don’t Hate Me Project”, “Rainbow Coalition against Discrimination” “Human Rights Work”, “Internet and Sexual Rights”. 3) What is a priority Kaos GL’s agenda? We work against to abuse of LGBTİ rights, violence, hate crimes and hate murders. We really care about being in street for our visibilty. 4) Why did Kaos GL want to become a member of IGLYO? Members of Kaos GL and LGBTİ activist in Turkey are mostly young and student. However, we think we were not enough for creating and implementing young LGBTİ policies. For those reasons, Kaos GL decided to be part of IGLYO. We want to be an organization which develops more policies, activities and increasing awareness between LGBTİ youth. Also, we knew that being part of international organization like IGLYO would improve our vision. We would like to be partners in the international arena. We believe that homophobia and transphobia are global issues. We need to combat for global solidarity and global network. Don’t forget the importance of being organized. We have more ways to touch the rainbow! Here you can find Kaos GL’s organizational history video from International Hrant Dink Awards, which shows Kaos GL’s history and work. 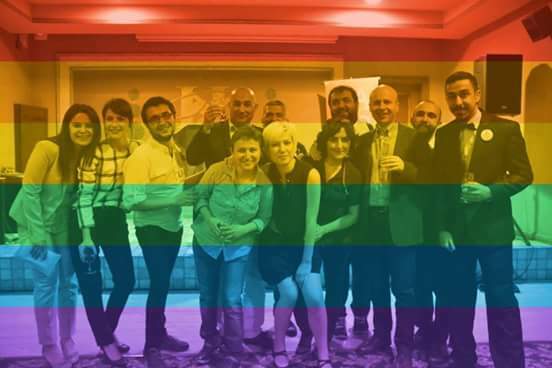 In addition, you can read more here about IGLYO’s work in supporting the trans community in Turkey together with LGBT Forum Progress and Kaos GL. Would you like to know more about Kaos GL’s work? Photo courtesy of Kaos GL.